Since I bought my first pontoon boat last year, I have begun to look at rivers in a new way. Now I not only think about if I can access them somehow on foot, etc. I also think about whether I can float the river or not. For wilderness areas, getting a boat to a river adds an extra challenge. This past August my good friend Jeff and I took my two Buck’s Bags Pontoon boats down the Elk Flats trail and floated the Wenaha River from the confluence of the north and south forks down to Troy, Oregon where the Wenaha flows into the Grande Ronde. It was difficult to get the boats down there though and I have been looking for a better way ever since. I first began looking into inflatable kayaks. They sounded like they would do the job, but for small rivers like the Wenaha, it might provide a bit of a challenge getting in and out constantly. Then someone told me Scadden had made an inflatable kayak with a hole in the floor so you could stand up when you came to a tree across the river or wanted to stop and fish. One of the boats was called an Escalade. The only bad thing is that they don’t make them anymore. To make a long story short, I found a used one a few weeks back and bought it. Since then I have been itching to try it out. I thought a good first trip for the boat would be going down the Hoodoo trail into the Wenaha. Hoodoo trail is the easiest access to the Wenaha other than hiking up from Troy. Hoodoo is only about 3 miles long and only loses about 1400 feet in elevation. So it is about as easy of a trail that goes down a mountain as you are going to get. From the bottom of Hoodoo to Troy is about 9 miles and that sounded like a nice easy distance for a new boat. If something went wrong I could easily hike the rest of the way out and hopefully it would be long enough to bring to light any shortcomings of the boat itself. I headed out early Friday morning. I arrived at the Hoodoo trailhead a little after eight and began to get the boat ready to take down the trail. There are two ways I could see taking the boat down. One way would be to deflate the boat and then attach it to my pack. I would probably have to carry the oars and maybe the pump. 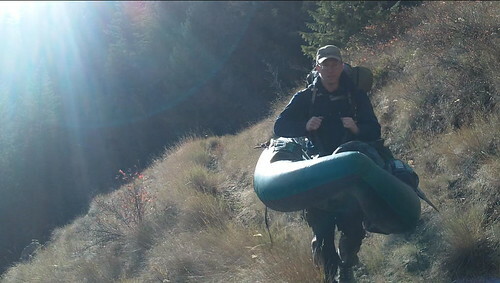 Or I could leave the boat mostly inflated and carry it down the trail. I went for the leaving the boat inflated option. I had picked up some wide nylon straps from the hardware store on Thursday and I attached two of these to the boat in the front and back. I could then stand in the middle of the boat and put the straps over my shoulders. It worked, but you couldn’t see where you were putting your feet very well. Luckily Hoodoo is a pretty nice trail or I might have wiped out. I think next time I will try and attach it to my pack so I can see where I am going a little better. It was a cool morning, but I worked up a good sweat carrying both my camping gear and boat down the trail. By the time I got to the bottom I was ready for a short rest and a snack to refuel. My plan was to float part of the distance to Troy that day and then float the rest of the way Saturday to meet my wife and kids. Since I was going to have someone waiting for me, I did not stop and fish every spot that I would normally fish if I were simply hiking. I stopped at my favorite, most productive spots and left the rest for another day. Although the day warmed up into the 60s, it was chilly floating. The water was often splashing on me and kept me from getting too warm. The last time I fished the Wenaha in October was probably five or six years ago. That trip we went down Cross Canyon trail and I ended doing more sleeping than fishing. What little fishing I did do that weekend was good, but I was not sure what I should expect to find in the Wenaha in October. Usually I let steelhead fever take over by late September and that is the end of the Wenaha until next springs runoff is over. Bull trout are a fall spawner and I was not sure it there would be many bull trout in the main river. Last year I fished below Hoodoo in September and did not find a single bull trout. They were all up the tributaries spawning. I began fishing and caught a couple of nice bulls right away though. So the bulls are done spawning and have begun redistributing themselves downstream. But I caught more rainbows than anything and they were nice fish. Most of them were fat, healthy 12”-16”ers. I even caught one rainbow that was around 18”. This is not the norm for the Wenaha. There are nice rainbows in there, but typically they are few and far between. The main reason to fish the Wenaha is for its abundant bull trout. But this was not the same Wenaha that I fished this summer. When I got down to the river I immediately noticed quite a few Ocober Caddis flying about. But once I got on the water there were lots and lots of Caddis. I personally have never seen so many October Caddis at one time. For this reason I switched back and forth between fishing a streamer/nymph setup and a large orange stimulator. It was at a particularly good long, deep, wide run about a mile downstream of Hoodoo that I met up with that 18” rainbow. I gave the fish a few moments to get back into feeding position and then cast again, this time I gave the rod a wiggle at the end of the cast to throw a bunch of S curves into the line, giving my fly more time to sit in the calm water behind the large boulder. I didn’t need it though. The large rainbow shot like a rocket straight up out of the water with my fly. He wasn’t going to miss the next October Caddis dinner. I did not think that I would actually get the fish hooked as wild as it all was happening, but when he landed I set the hook and to my surprise I had him on. This fish had good aim as well as good rocket propulsion skills. When I got him landed I had a hard time getting my hand around him. I would have to say that was the biggest mountain rainbow I have ever caught. I have caught bigger rainbows in lakes, spring creeks, and tailwaters, but that was the biggest freestone rainbow for me. I floated my way downstream until I was about half ways to Troy before I made camp. The river was definitely lower since the last time I fished this section and certainly lower than when I floated the Wenaha in August. But the boat did well and if I was careful about picking my path it was rare that I would have any problems floating past the shallow end of the tailouts. From my float earlier this summer I found the Wenaha was actually much better to float in the upper half of the river. The canyon stays narrower and the river tends to be deeper on average from the forks down to about Fairview Bar. Fairview Bar is a little over a mile upstream of Hoodoo. From Fairview Bar downstream the canyon seems to be a littler wider and with it the river tends to widen as well making it a little shallower in the tail outs. I found a good spot to set up my tent and I was happy to get off the water, dry off and warm up. After dinner I crawled into my tent before it was even dark. I do not usually bring books when I have to pack them on my back, but I have had this one book for a while now that I wanted to read. It is called Coyote Staircase by C.F. Button. C.F. Button is a retired BLM wildlife biologist who spent some time working in Joseph Canyon. His book, a mystery novel, takes place in Joseph Canyon just below the Forest Service ground where I have been hiking in. I started reading it around six and . . . well I didn’t put it down until 12:30 in the morning. To say the least I enjoyed it, the whole thing. I would not recommend reading certain chapters of this book at night, in the middle of bear country, by yourself in the woods. 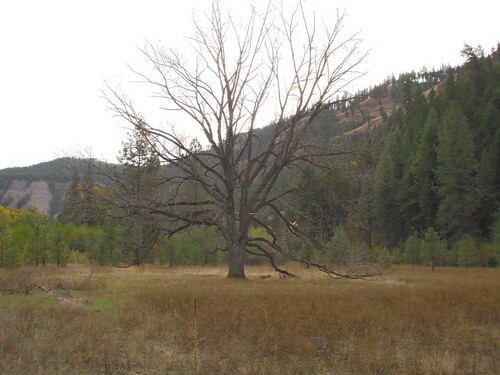 There is a bear in his book that, according to an old Nez Perce woman, is charged with guarding the cave where Chief Joseph was born on Joseph Creek. This bear has somewhat of an eerie presence in several chapters and I will have to admit that it did make me feel a little nervous. I spend a lot of time in the woods by myself, even in the dark, and I usually don’t get weird, eerie feelings about bears in the middle of the night. Between staying up late reading my book and the cold frosty morning, I didn’t feel any need to crawl out of my sleeping bag until the sun began to hit my tent at 8. Even after that I was feeling quite content enjoying the woods, the river, and a hot cup of coffee. I felt content enough that I made a second pot of coffee as well and continued to simply enjoy the morning. After a late start I stopped floating to fish several good spots. It was at one of these that I broke my flies off and went to grab a new piece of tippet from the spools that hang around my neck. But when I went to grab them they weren’t there. I had set them on a log beside my waders and they were still on that log about two miles upriver. I had doubts about hiking back up to get my tippet spools. My wife was supposed to be driving to Troy to meet me and I didn’t want to get there too late in the day and maker her worry. The other thing I did not like the thought of was leaving my boat there, her and the kids walking up from Troy and finding my boat and fly rod but not me. I decided to hike back up the trail, not wanting to leave something behind that would just eventually become garbage that someone left along the river. I had dressed warm for floating a river that was running a cold 48 degrees or so in late afternoon the day before. It was too warm for hiking up the river to get my tippet spools I foolishly left that morning. With my multiple layers I had a good sweat going by the time I got back to where I had camped. I decided I would try and walk along the bank of the river that did not have a trail. I thought it would be a little slower going and therefore I wouldn’t work up as much of a sweat. Just downstream from where I camped was a big meadow, exceptionally clear of rocks. Then I found a nice pile of rocks, a large broadleaf tree, and an old iron wheel from a farm implement below the tree. Someone had went to a lot of work clearing the rocks from that meadow and putting them in a pile. The tree was substantial as well. I am not sure what kind it was, but I do not think it was native and it had been planted a long time ago. Walking further along I found more treasures. I found an old sickle bar that still had enough paint on it that you could read McCormick on it. When I got to one section there seemed to be rocks in a long line, almost like a small dike. But about 10 feet to the other side was another long row of rocks. These two parallel lines of rocks went down the river quite a ways and I found the same thing in a few other spots. The only thing I could think of was that this was their road and they had been moving the rocks off to the side to get them out of the road for quite some time. Once I got back to my boat I decided I had better skip fishing the last couple miles of river so my wife wouldn’t start worrying about where I was. I also figured there was going to be three boys waiting for me to take them fishing. It didn’t take me long to float the rest of the way and as I rounded the bend at Grizzly Flats I saw three boys fishing the river. This entry was posted in Wenaha and tagged hoodoo. Bookmark the permalink. Hi Grant. First, I want to thank you for your truly enjoyable trip reports. They are very informative, much like reading a good book. I live in Colorado, but have been coming to your area for the past 10 Octobers to fish the Grande Ronde…it’s the highlight of my angling year, swinging for steelhead. I floated from Bogans to the mouth of the Ronde twice this year. My son rowed me the first time…imagine when your boys are old enought to do that! I have spent most of my life seeking wilderness places to fish, and understand your passion for same. Anyhow, the other reason I wanted to write was to identify the flower that you were in question about on your Sept./Oct. float trip down the Wenaha. (My wife is quite knowledgeable about wildflowers and often accompanies me to The Ronde, she is the one who provided the i.d.). The flower is called Indian Pipe or ghost plant. Thanks again for your enjoyable writing. Happy New Year. Thanks Bob. Indian Pipe always look like something that should be in a fantasy or science fiction movie to me. It just doesn’t look natural. 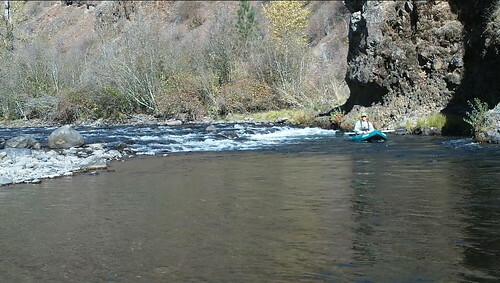 And I am looking forward to some float trips on the Grande Ronde as the boys get older. Great trip report. My friend and I want to do something similar to this later this summer. We plan to hike in on a Friday and try to make it back to Troy late Sun (2.5 days on the river). Do you think Hoodoo to Troy is too short of a float for 2.5 days on the river? Or do you think we can extend it from Cross Canyon trail to Troy? We want plenty of time to stop and fish and don’t want to feel like we’re in a rush. That should be a great time frame to get lots of fishing in between Hoodoo and Troy. Have fun! Ah it is a man after my own heart. I have fished Hoodoo to Cross Canyon over 50 times. I just quit counting after 50. In fact, I flew back to address a congressional committee to encourage them to place the Wenaha into a federal wilderness. I have caught three chinooks in there by accident – on six pound test and ultralight reel. The river is a very special spiritual place, and i am always at my best and happiest when i go in there. Here is hoping it remains in pristine condition long after i am gone.